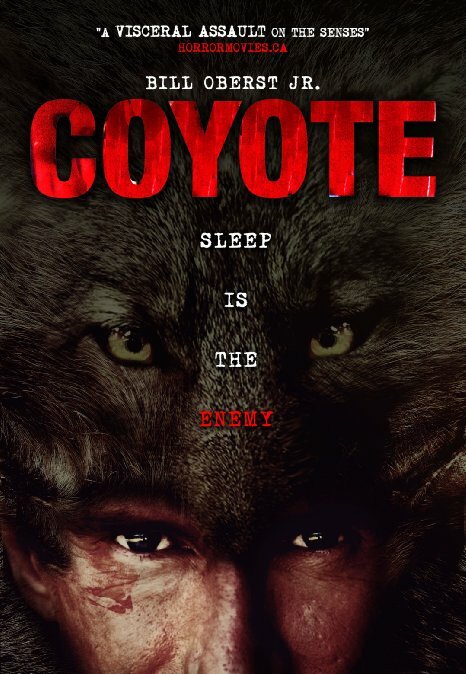 Having no prior knowledge of Coyote before watching it, I have to say that I was very surprised, clearly an indie with a budget to match but the film puts you off kilter almost immediately and never lets you balance up throwing in some nightmarish visuals and some quiet shocks along the way. Coyote tells the story of Bill (Bill Oberst Jr.) a writer, who right from the get-go we know is not in a good space. He is not sleeping. In fact he is afraid to sleep. If he sleeps, he thinks he will die. Only problem is with no sleep comes the hallucinations, things start out bad and only get worse as Bill’s mind falls apart. Arthouse and horror have been mixed before generally the well-known films that do this are now regarded as masterpieces and their directors, probably the two biggest at any rate - Lynch and Cronenberg are quite rightly lauded. Trevor Juenger’s film isn’t at this level but the film certainly has some very iconic moments. Generally Juenger keeps the framing of the film very tight with everything else not in the frame regarded as superfluous for the most part. He experiments with a number of effects too and rather than distract from the film it adds another layer to it. The music by Michel Schiralli is a mixed bag of low bass fuzz, digital blips and drums. It’s a great a score and completely marries up with the visuals on screen. Bill Oberst Jr. takes the film head on and wins, it’s a really quiet performance (for the most part) and Oberst Jr’s voice combined with a weird physicality really suits the film. His muttering combined with his violent outbursts and balls out performance really raises the film to another level. I always love it when actors go all out in films and Oberst Jr’s acting here is really great. He supported by a wonderful cast each one of them playing their part. For the first forty minutes of the short seventy-five minutes run time, Coyote had me in its spell. I was in turns uncomfortable, amazed and freaked out. However as Bill’s mental state disintegrates so does the thick atmosphere created. As Bill becomes more violent the film falls of the tightrope it was so skilfully balancing on and the last 30 minutes are messy, creative but messy. Coyote is certainly not a film that you’ll want to watch with a bunch of friends (well at least I didn't) but one that is best viewed by yourself, if you are open to an Arthouse-horror blend then you should seek out Coyote. Thanks for taking the time to watch an review such an unusual and non-mainstream movie. I was proud to be a part of something that provokes strong reaction and aspires to be artistic. Appreciate you giving Trevor Juenger and "Coyote" some visibility. I enjoy the blog.